The Scrutinies by Mary Kay Fosnacht, Kansas City. 39” x 72”. 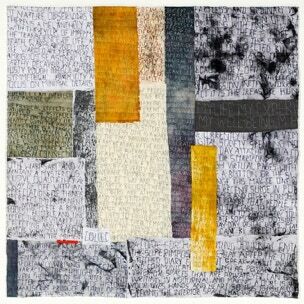 MKF: This set of three quilts was inspired by reflections written by my husband Fred Fosnacht. They represent the stories of the woman at the well, the man born blind and the raising of Lazarus. JC: I love words. Words have shapes and sounds and they convey meaning. These pieces are expressions in cloth, paint and stitch of my sadness of the gradual disappearance of handwriting and penmanship. 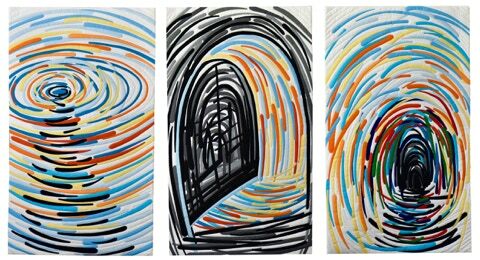 Open Book by Jette Clover, 51” x 32”. Photo by Pol Leemans. In Other Words by Jette Clover, Antwerp, Belgium. 37” x 37”. Photo by Pol Leemans.